If you love watches and enjoy the ever-changing current of the Solent, then you might really enjoy watching the comings and goings of yachts of many classes during the British Classic Week in Cowes, Isle of Wight, England. Italian watch giant Panerai has been the time partner for the Classic Yachts Challenge for the last eleven years, which encompasses a gaggle of nautical races across the world starting in Antigua mid-April, heading through Europe, and finishing in Cannes in late September. I have been an admirer of Panerai since the late 1990s when it was still owned by Vendôme, which turned into Richemont in 1997. “Pre-Vendôme” versions of the iconic Luminor and Radiomir models – of which there are very few – fetch significant vintage-market prices. I have been a Panerai owner for eight years, so it was a delight for me to mix with these great watches, whose origins are firmly set in the 1940s Italian navy. And the splendid yachts ranging from the magnificent Eleonora (a recreation of a wooden schooner) to more modern carbon-fiber models didn’t hurt, either. Although the Luminor 1950 3 Days Regatta Flyback Chrono Titanio (PAM 526) is the official timepiece for the Classic Yachts Challenge, several other Panerais were also on show, including the PAM 614 and PAM 615 versions of the Luminor Submersible 1950 3 Days Chrono Flyback Automatic Titanium, which was released at SIHH 2015. These two Luminor editions continue the line of Submersibles begun with the 44 mm PAM 024/PAM 025 and the 47 mm PAM 305 of recent years housed in brushed lightweight “1950” titanium cases. The PAM 615 boasts a ceramic bezel as well as interestingly designed chronograph subdials. Both of these chronographs sport the previously seen “blue” flyback hand, and each is powered by the automatic P.9100 in-house movement launched in 2013. Unfortunately, Panerai’s Eilean, a 1937 Marconi ketch, was not present, which was a shame as she is a magnificent example of a sailing boat with two masts built by William Fife & Son, boat builders at home in Fairlie, Scotland. Not only famous for being lovingly renovated by Francesco Del Carlo boat yard in Viareggio on the Italian coast, she was also featured in the marvelously tacky (in a cool kitch way!) 1982 Duran Duran “Rio” video, where my mind will not let me forget Simon Le Bon and gang posing onboard in baggy linen with scantily dressed beauties! There were, however, plenty of other stunning examples of yacht royalty to take in with sheer delight. Eleonora, a vintage gaff-rigged schooner built in 2000 at Van der Graaf in Holland, is a replica of the 1910 Westward schooner. The original Westward was actually blown up on July 15, 1947 after she went into disrepair, as the owners couldn’t keep her in pristine order. 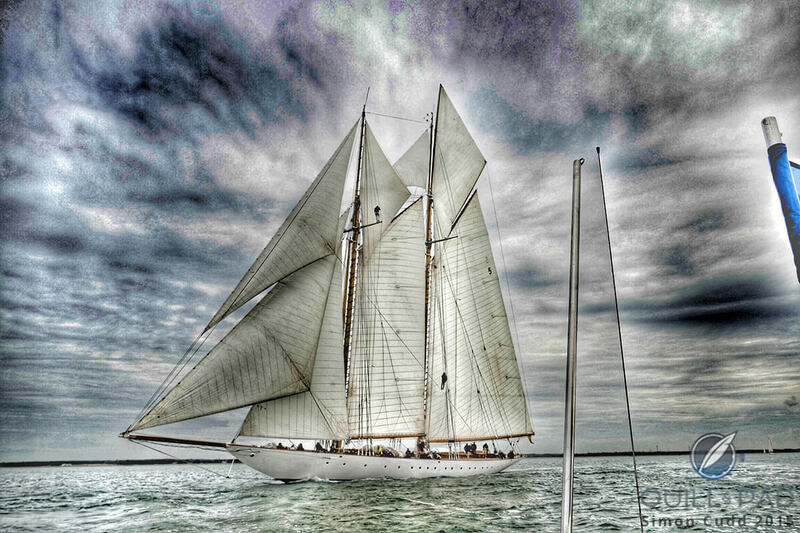 Eleonora is one of the largest big class racing schooner replicas ever built. She has some pretty impressive stats as well: at more than 41 meters (120 feet) and 213 tons, she certainly commands a presence. And with a sail surface area of 1100 square meters, she is even more impressive when on full display. All this watch chat and fresh air certainly made one sleepy, so a 20-minute ride at high speed across fairly flat water brought us to our hotel, The George at Yarmouth, which was built in 1670 for Admiral Sir Robert Holmes, the governor of the Isle of Wight. Holmes, it seems, chose to live by the sea so that he could make use of his entitlement of two-thirds of the value of any ship and/or her cargo in Isle of Wight waters. Over the course of the following twenty years or so years he made a fair amount of money, tantamount to piracy! Lovely food and wine were certainly the order of the evening, however it was the view from the end of the private garden across the beach looking out over the sea and jetty that captured my attention into the night. The overall winner both in class 4 and the combined fleet race, Jap, not only the smallest but the oldest yacht, built in 1897 at William Fife III in Scotland, took the overall prize at the regatta. Owner David Sherriff received a lovely Radiomir 1940 3 Days Acciaio as first prize. The new case shape launched at SIHH 2013 takes direct reference from the original shape of Panerai’s watches. This PAM 514 reference with its subsidiary seconds dial and silvered hands completes the unique Panerai look of the black sandwich dial, while the highly polished 47 mm stainless steel case is totally set off against the cracked vintage strap that this particular prize came on. It certainly wasn’t all “plain sailing” out on the high seas! Aside from the various yachts racing in their classes, aboard the aptly named motor boat Time Travel 2 our group of journalists and brand representatives was whizzed around to see various races, including that in which Sir Ben Ainslie was racing. Ainslie and his crew participated in this year’s 35th Louis Vuitton America’s Cup race in a Landrover-sponsored BAR A45F foiling catamaran. Yachts aside, it was spectacular to see the HMS St. Albans frigate anchored in the Solent, but we noticed several sailors readying her for what looked like a helicopter landing. Sure enough, about 20 minutes later a Merlin AgustaWestland AW101 came in to land! Quite a dramatic scene: watching a Merlin AgustaWestland AW101 helicopter land on a frigate! Those interested in architecture and hotels will possibly already know about the old forts situated outside Portsmouth that have now been converted into hotels. Having popped onto a rib to check one out, to my amazement a coastguard helicopter in its instantly recognizable red and white livery flew over and proceeded to hover close to the fort in preparation for either a drill or real-life situation. The Royal Yacht Squadron, one of the most prestigious yachting clubs in the world, hosted invited guests, press, and Panerai staff to celebrate collaboration over the years. Now 200 years old, the Royal Yacht Squadron can actually boast one female member – so things are progressing in this most traditional of male-dominated clubs. Perhaps this has something to do with Queen Elizabeth II being its patron? It was an eventful few days to say the least. The next leg of the Panerai Classic Yachts Challenge is in Marblehead, Massachusetts during the Marblehead Corinthian Classic Yacht Regatta. This club claims to be the birthplace of the American navy, making it the ideal location to begin the U.S. leg of these immensely wonderful sailing challenges. You can follow events at www.panerai.com and www.paneraiclassicyachtschallenge.com. Loved this article; especially, the photography! Really made me appreciate Panerai more. Agree with the above, stunning photography here. Great job.